Can open MDB and Accdb files. Table opening, viewing and inline editing. Standard search and partial word search. Filtering / sorting records by fields. Table and query result printing. Record view (form style view). Query - standard SQL select statements. Opening and saving of SQL statements to file. Table Info (field types) plus printing of structure. 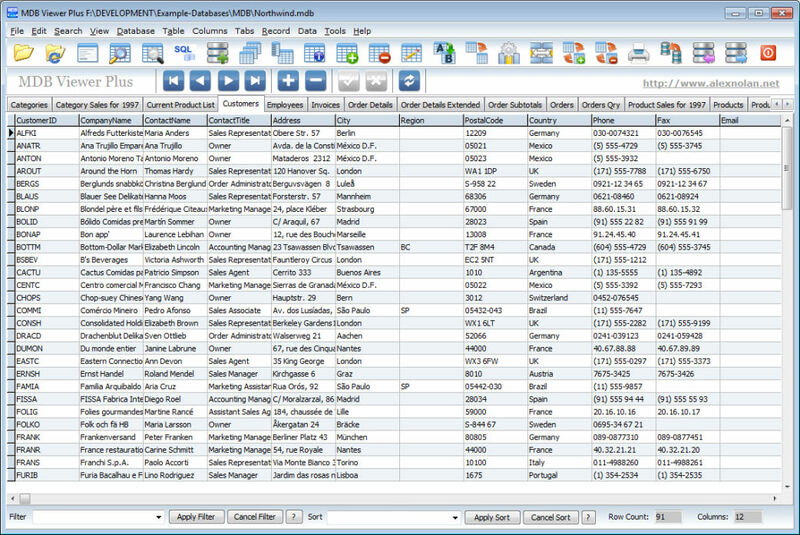 Exports to TXT, HTML, XML, DBF, XLS, WKS, RTF and PDF. Import from CSV,TXT,Doc,XLS,WK1,WQ1,SAV,DB,DBF,MDB,ADO,ADT,DAT,HTM,XML,WAB and VCS. Support Access 2007 Accdb files (Provided "Microsoft Office Access database engine 2007" is installed). Create / rename / delete table. Set / change / remove password. Support for Workgroup Files (MDW). Display related child table link to the parent table. Add / remove / rename / alter fields. Customisable many to many relationship dialog.